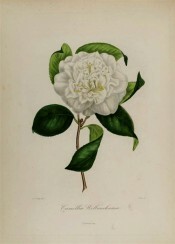 A Camellia japonica L. cultivar. ‘Wellbankii’ has yellowish-white flowers to 8.5cm across, the petals somewhat confused, the outer roundish, with undulated margins, the inner irregular and twisted in tufts. [ICR]. ‘Wilbanksiana, or heptangularis. - Leaves one inch and eight lines broad, and three long, oval, lanceolate, a little acuminated, reflexed, slightly dentated, some of them elliptical, smooth, of a yellowish green, glossy; bud spherical. scales blackish; flower white, double, four inches in diameter, irregular, petals of the first row, broad, crenated at the summit, grouped in the centre, in a manner to imitate the union of several flowers, which are contained in a common calyx; those of the interior are smaller, erect, rumpled, reflexed, intermingled with stamens. – Superb.’ [Berlèse Monography p.50/1838]. Imported from China by Bassington of Stoke-Newington, and first flowering in 1819, it was named for Captain Wellbank of the East India Company who was responsible for introducing a number of camellias to Britain. [ICR]. ‘The branches are peculiarly stiff and erect, the flowers not so large as the double white, but very delicate; in form and texture they are inclined to resemble those of the Gardenia Florida.’ [LBC no.1198/1827]. BR f.708/1823. Berlèse Iconographie vol.I pl.12/1841. Listed in all published catalogues [T.271/1843]. Received per ‘Sovereign’ February 1831. [MP A2948-2]. It was named Wellbankiana in both the 1830 and 1836 Loddiges’ catalogues held at Camden Park and marked with a ‘c’, denoting grown at Camden, in the latter. It was marked with a ‘+’ in the 1830 edition but the meaning of this is unclear [CPA]. ‘Wellbankii’ was also marked ‘x C’ in an article by ‘G.A.L’ in the Horticultural Register. Although this book originally belonged to James Bowman and only later to Macarthur, this seems to confirm that it was grown by Macarthur much earlier than 1843. [HR p.633/1832]. The code ‘x c’ indicates grown at Camden but not new to the colony.